Automated cooperation is arriving in practice, for instance in vehicular automation like platoon driving. 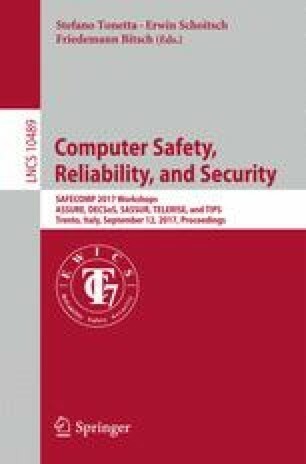 The development and safety assurance of those systems poses new challenges, as the participating nodes are not known at design time; they engage in communication at runtime and the system behaviour can be distorted at any time by failures in some participant or in the communication itself. When running on a highway, simply switching off the function is not an option, as this would also result in hazardous situations. Graceful degradation offer a systematic approach to define a partial-order of less and less acceptable operation modes, of which the best achievable is selected in presence of failures. In this work we propose an approach for assurance of the degradation cascades based on mode-specific assertions, captured by assumption/guarantee contracts. More specifically, we share our experiences and methodology for specifying the contracts for both the nominal safe behaviour as well as the less safe but acceptable behaviour in presence of failures. Furthermore, we present an argument pattern for adequacy of the degradation cascades for meeting the global safety goals based on the contracts. We illustrate our approach by a car platooning case study. This work is supported by EU and VINNOVA via the ECSEL Joint Undertaking project AMASS (No. 692474).